There are many good options to choose from when looking for a hammock to take camping. 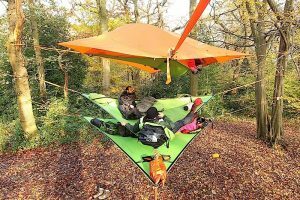 With developments over the last several years, camping hammocks have been made to be lightweight, portable, and all-around convenient. Finding the best camping hammock for you really depends on your needs. If you’re looking for an option to have around your group campsite, a double hammock is a good bet. On the other hand, backpackers should consider a solo light weight option. For those who are considering using your camping hammock for sleeping a hammock with a bug net is a good idea. Browse the chart below to get a sense of some of the best camping hammocks and compare them by capacity, whether they include bug nets, price, and rating. 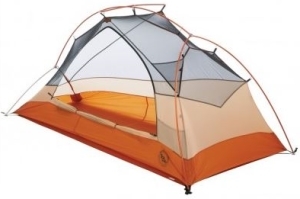 Hopefully the table above was useful in getting an idea of which model might be the best camping hammock for you. Now we’ll go into more detail on a few of our favorite hammocks to further differentiate the options. 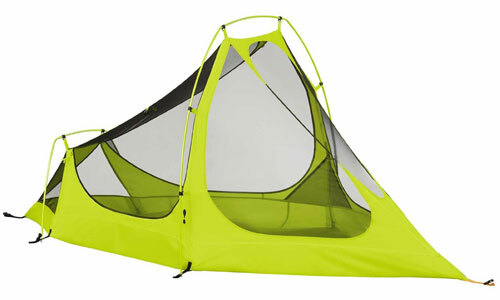 The Tentsile Trillium Hammock is a rare hammock that can accommodate up to three people. It has a weight capacity of 800 pounds! Unlike traditional hammocks, this model is a triangular shape with very little give once put up. It does not sag much even when three people are on it. 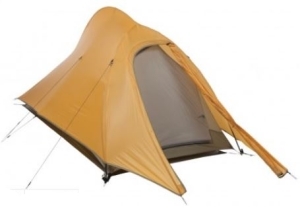 It can be paired with a Trillium tree tent, or can just be a standalone hammock. There are two fabric options available, one that is polyester and one that is mesh. While it is significantly heavier than other camping hammocks, it still maintains a manageable packed weight of 14 pounds. The G4Free Portable & Foldable Camping Hammock is made to be slept in during overnight excursions and is designed to keep pests at bay. 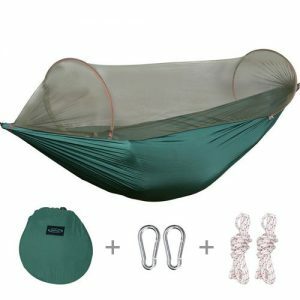 The hammock bottom is made of a mildew-resistant parachute nylon, while the sewn the canopy portion is made of a fine mesh. There is a one person capacity for this hammock, but with the hammock bottom measuring 110 inches long by 50 inches wide it is fairly roomy. It also has a 400 pound weight capacity! Like most hammocks, this one is conveniently portable, weighing 28 ounces. Purchase includes a 13 inch by 11.8 inch carrying sack, two carabiners, and two pieces of shock cord. 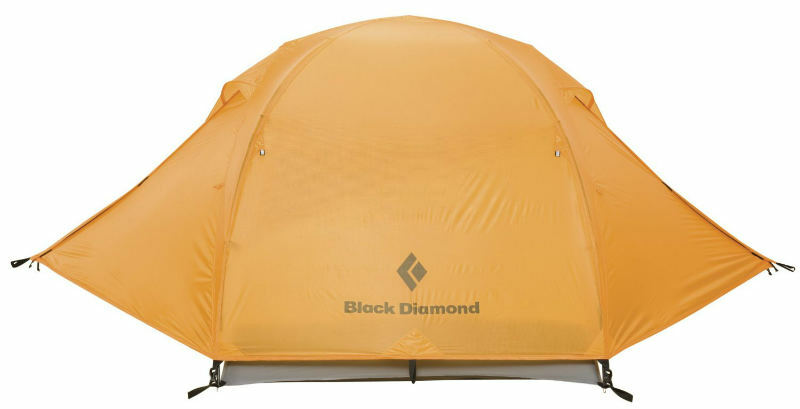 One thing to keep in mind if you think this might be the best hammock tent for you is that the minimum hanging distance is 11 feet. Just consider your environment to be sure that will work! If a two-person hammock is your ideal, the Winner Outfitters Double Camping Hammock is a good option to consider. 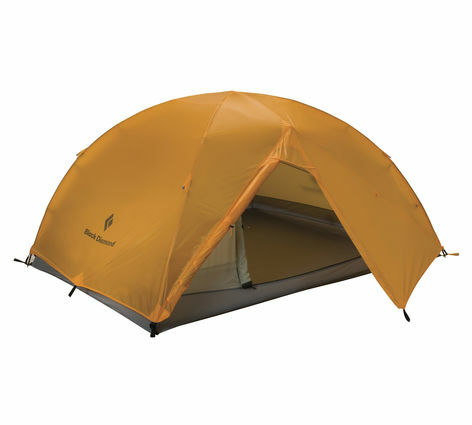 It’s made of durable 210T nylon parachute fabric, and measures 118 inches long by 78 inches wide. An impressive weight capacity of 500 pounds also means it can easily hold two adults. 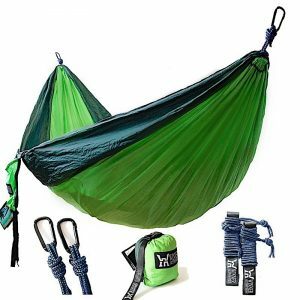 Unlike other options, this hammock includes two 137-inch-long ropes, two 52-inch-long tree straps, and two steel carabiners; many other hammocks sell the straps and accessories separately. Even with the included accessories, the price point for the Winner Outfitter’s hammock is still lower than other similar hammocks. The entire package, accessories included, weighs just 1.4 pounds. Feedback for this hammock is overwhelmingly positive; with an average rating of 4.8 stars it’s no wonder it stood out on our best camping hammock countdown! There are two aspects of the hammock that reviewers mentioned could use improvement. Firstly, the tree straps could be longer for more versatile use out in the wild. Secondly the carabiners are made from steel instead of aluminum, making them heavier. The second factor isn’t a huge deal unless you’re doing serious backpacking, though.